Sales Opportunity: Sell Bespoke Printing Products and Services to Any Business - Excellent Residuals! The team members at Affiliate Print prides themselves on delivering the highest-quality products at a fraction of the time and cost of their competitors. They're now looking to expand their brand outwards and are looking independent sales reps to help them enter new markets. 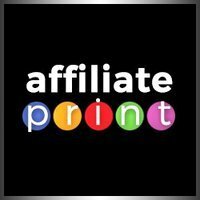 Independent sales agents interested in working with Affiliate Print can connect with them here: Apply to work with Affiliate Print. Nearly five years ago, our team started off by offering an online standard printing service. We quickly became a fundamental player in the market and proved time after time that we could deliver online printing orders cheaper, easier, and faster than our competition. Our passion is in delivering the most affordable, easy, and fast service possible. Welcome to Affiliate Print. 2. Can you tell us a little about your expertise in the printing industry? We use a wide variety of processes for providing high-quality packaging finishes with color fidelity. We create offset and flexographic printing on state-of-the-art seven-colour machines, using special colors and surface lacquers, holographic film, UV lacquering and stamping. Our specialists process your details and data from our pre-press service centers. That means shorter paths, quicker deliveries, and lower costs. Affiliate Print's roots are in the printing industry. We produce every facet for your in-house print projects with almost any kind of print material you can imagine. Whether you have a custom print job or a complex project, we can turn your idea into reality. From one-to-one variable data printing to traditional print production, Affiliate Print has the print solution for you. Our experts are totally committed to assisting our customers in any way possible. We provide a better way to manage the design, artwork, printing, storage, and distribution of your printing products. We refer to this as your "total print solution". 3. What made you consider working with independent sales agents? Building an impressive portfolio of products and services is more important than ever. Printing has become profoundly more complex as conventional boundaries have continued to fade. Technology is making competition more heavily based on capabilities and knowledge. The value-added potential of many businesses is shifting toward knowledge, systemic innovation, and service-based activities. Virtual integration, partnerships, strategic alliances, and joint ventures, are becoming vital parts of competitive strategies. To stay ahead of the coming trends, we at Affilate Print decided to expand our business into the national and global market. We joined CommissionCrowd to work well beyond expectations and boundaries. While there are many platforms like LinkedIn and Lynkos, none of them offered what we were looking for like Commissioncrowd did. Independent sales representatives come with their own clientele, ensuring quick routes to markets we otherwise can't access. They're also significantly less risky to hire than their in-house counterparts. Outsourcing sales to independent sales reps is a great way to promote profitability and growth. 4. Can you tell us about some of the work you've carried out to date? Our clients work with us because we provide access to the strategies, technologies, and creative it takes to grow an organization.We've had many success stories in the past five years. Our clients have included media consultants, SMEs, entrepreneurs, accountants, takeaways, restaurants, local businesses, print resellers, fashion designers, photographers, makeup artists, e-commerce stores, general stores, and superstores. We've had success printing both deluxe and economical brochures, booklets, magazines, and folded leaflets. Our work is often carried out overnight and delivered the next morning in order to get our clients' dreams printed. 5 . What's your greatest client success story? When it comes to food, consumers tend to judge brands by their packaging. The owners of a world-renowned Kashmir restaurant were looking to monitor their key brand's equity and packaging print. They needed to get consistent brand messaging, evaluate their print quality, monitor their color expectations, and create an effective print quality program. So they turned to us. We provide an excellent opportunity to sell bespoke printing products to any size of business. And our products provide reliable and sustainable residuals. Our position is perfect for full-time freelance sales agents or freelance graphic designers and marketing consultants looking to sell added services to their existing clients. Print services are required for virtually every business. Advertising is essential to a company's success, and our personalized, high-quality, affordable printing products can be offered to any clientele you come across. If you're a self-employed entrepreneur with a knack for meeting people and making business, our company is interested in working with you. Our wide range of inventory means you'll never be restricted to a single industry. We delivery to eight foreign countries at our base price, which means more opportunities for agents to improve their incomes. 7. What sets your service apart from the competition? The UK is the fifth largest producer of printed products in the world. The print market is a £700 million industry. Printing accounts for an average of 56% of turnover, with finishing and binding in second (19%) and pre-press in third (8%). Outside of the traditional "step-before" and "step-after" activities for printing, mailing and fulfillment provided the next largest contribution to turnover, closely followed print management, web design, and database handling. Affiliate Print is one of the fastest-growing e-commerce platforms in Europe. What began as a two-member project in 2013 has quickly become an international organization with over 50 members. Our platform, now live in eight countries (and counting), is visited by millions of people every year. But we're still trying to improve, aiming for bigger and better achievements with everything we do. Affiliate Print is for everyone, everywhere, and it's our mission to make ordering print easier for you. We support your needs by combining the most convenient online ordering process with the best techniques for producing prints. We ensure that our prints are on time and of top-notch quality. We do everything to make clients 100% satisfied. 8. What are your plans for the future of Affiliate Print? We believe that companies should act responsibly towards society and make the world a better place to live in. The world belongs to everyone, and so we strive to provide equal opportunities. We plan on hiring more quality in-house staff taking and sales agents across Europe in the near future. 9. What are your best-selling services and why? We sell a variety of products to companies of all different sizes. Our best sellers tend to be business cards, custom sized banners, letterheads, postcards, posters, roll-up banners, stapled booklets, flyers, and folded leaflets. We've received exceptional feedback from our customers. 11. Describe your typical sales cycle and process. A well-developed, well-managed sales cycle is critical to the health of any business. Our follow-up process focuses on keeping our customers happy, and it's how we earn repeat sales and referrals. Our agents market our products and services to a pool of clients. Upon receiving an order, our agents gather as many details as possible and send them to us to make a quote. Once an order is agreed upon, clients send payments directly to us. At this point, we generate a commission slip and forward it to the sales agent. Invoices are due within 15 days. Agents are paid after every completed sale. 12. How do you currently bring in new business and win contracts? Affiliate Print has over 50 employees, including top-notch advertising and marketing consultants, who actively seek new opportunities on social networks. We have print resellers in West Yorkshire as well as sales representatives roaming the streets of Manchester and London. We get clients through referrals and our website. Our products are advertised on various online classified websites. Our search engine optimization team constantly works to rank our company on page one of Google.We also distribute advertising newsletters and flyers nationwide. Next Post Expert's Corner: Secrets Of Closing The Sale Like A Pro!